I’ve said it before. I’ll say it again. Rowan patterns run big. Rowan produces beautiful knitting pattern books with high production values – thick, glossy paper, full page photos, interesting backgrounds, beautiful colours. They have a stable of fabulous designers who consistently turn out lovely garments. They have a sense of colour, and of colour playfulness, that can’t be beat. The patterns all use Rowan yarn (of course) which I love and use frequently. I buy every issue and collect them; I pour over them again and again. I have knit many of their designs. That said, there are some things that drive me crazy about Rowan. They are not big on charting; though they seem to be getting better at this, there are quite a few patterns which I wanted to knit and decided not to, simply because there were no charts provided. A lot of their patterns seem unnecessarily fiddly, and the construction unnecessarily complicated. I recommend reading the entire pattern, and then think each step through carefully; don’t be afraid to rework the construction method. Remember that a good knitter can think of a pattern as a recipe. It won’t kill the brownies to add a little rum and go light on the sugar; and you might come up with something delicious. This same philosophy should apply to your knitting. The most serious problem with Rowan patterns, however, is the vast amount of positive ease they write into every garment. I tried knitting a Rowan sweater for Doug a few years ago. It had about 10″ of ease written in. I know that men like to have room in their sweaters, but that is ridiculous. I purposely knit down a size, and then ripped out and knit down a further size, and finally gave up all together with a partially finished garment that was huge. Every day, I would throw out pattern ideas to Emma, and each one would be rejected. On Boxing Day, I suddenly, for no reason that I can recall, said to Emma “We should just knit another Audrey.” And we both stared at each other, knowing instantly that Audrey was IT – the absolutely perfect sweater, both for this yarn and for Emma. Audrey was designed by Kim Hargreaves for Rowan 35. I knit one for myself in the fall of 2009 in black in Rowan Calmer, a cotton blend. I wrote a post last January about how versatile Audrey is; in the post, Emma, Leah and I all model my Audrey sweater. My point was that even though we each have different shapes and styles, the sweater suited each of us. Because the entire sweater is knit in 2×2 ribbing, it has amazing give and is very stretchy – thus, Emma can look good in my sweater. However, as soon as I said it, I could imagine how much better Emma would look in an Audrey that had actually been knit for her, in her size, designed for her shape. And a quick swatch of the Tosh DK in 2×2 rib showed up its fabulousness in every way. Lush. This yarn is lush. Looking over the pattern again, I struggled to find any reason why it should be knit in pieces and seamed. Now, the fact is that unlike many thousands of rather vociferous knitters, I actually enjoy knitting in pieces, and seaming. I think that in many sweaters (dare I say most sweaters?) the shoulders and sleeves look infinitely better if the sweater has been seamed. 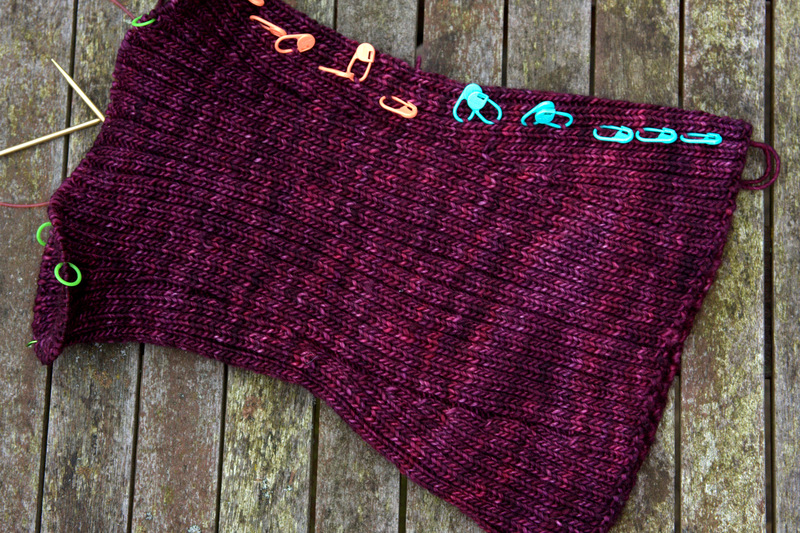 I know that it is all the rave to knit in one piece, usually top down, and I can see all the advantages of this, but the primary disadvantage is usually lack of proper fit in the shoulder and underarm and arm scythe. However, there are some styles of sweater for which knitting in one piece, with a yoke, is the obvious way to go. Audrey seems to me to be a clear candidate to knit this way. 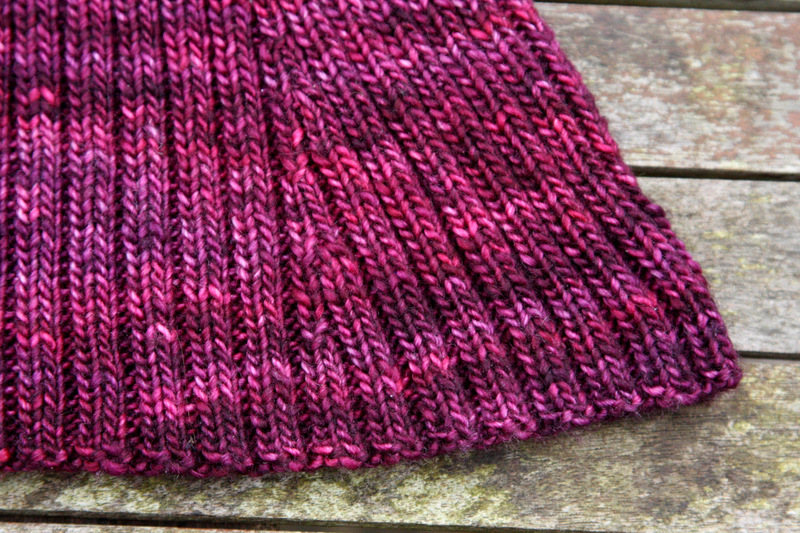 So, the first thing I did was to rewrite the pattern to be knit in the round, bottom-up. The second problem with the pattern is the sizing. Repeat after me: Rowan runs big. The smallest size for Audrey is an XS, which is listed as a size 32. Remember that this sweater is knit in rib, and that ribbing needs negative ease. This should be obvious. Ribbing, especially 2×2 ribbing, normally pulls in, producing a thick, cushy fabric. When it is on the body, you want it to be stretched out enough to give the rib definition – you should be able to see each rib articulated. See in the top photo below, how narrow the sweater looks; it is the width of my hand at the waist. But, as you can see in the second photo, when it is worn the ribs will stretch out and become articulated. They will pop. Ribbing gives an architectural interest to your sweater. 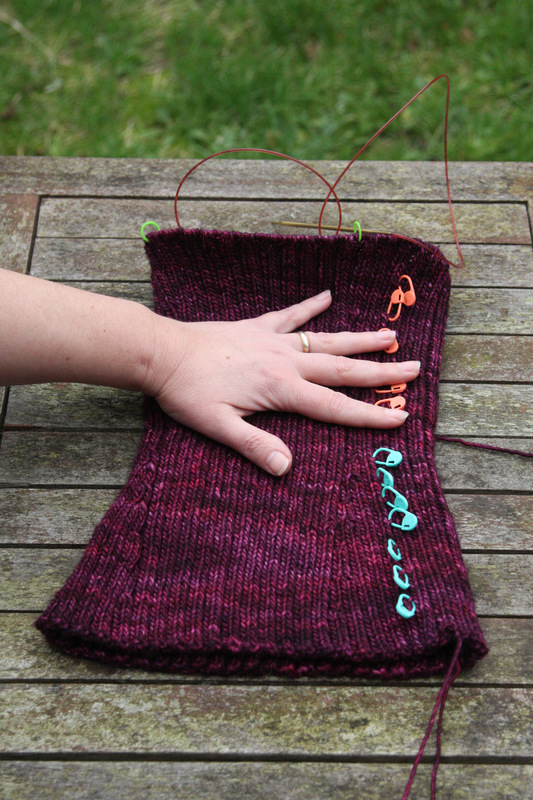 If you don’t put enough negative ease into the garment, the ribs won’t pop – and you might as well be knitting in stockinette stitch. Given all this, imagine my astonishment to look at the schematics for the sweater and see that the XS, which is designed for a 32″ bust, actually has 2″ of positive ease written into the pattern (that is, it is designed for a 34″ circumference around the bust). Thus, it is clear that the XS size in the Audrey pattern, the smallest size it is written in, is a good two sizes too big for Emma. What this all means is that I am rewriting the entire pattern, first to knit it in the round, and second to resize it appropriately for an XS. There was a chance that I could have finished it for Emma while she was home – if I had had the Audrey Eureka Moment in early December. As it was, I had only 7 days to work on it before I put her on the plane to fly back to Vancouver. So, I did the best I could – I knit the entire body of the sweater up to the armpits, so I know that this bit at least fits properly. Then, I took lots of measurements. I also had Emma try on my Audrey and took measurements on it. For Emma’s sweater, I am obviously making it a lot narrower, to fit her narrower torso, but also, Emma is taller than I am, so I will be adding an inch to the length and at least two inches to the arms. 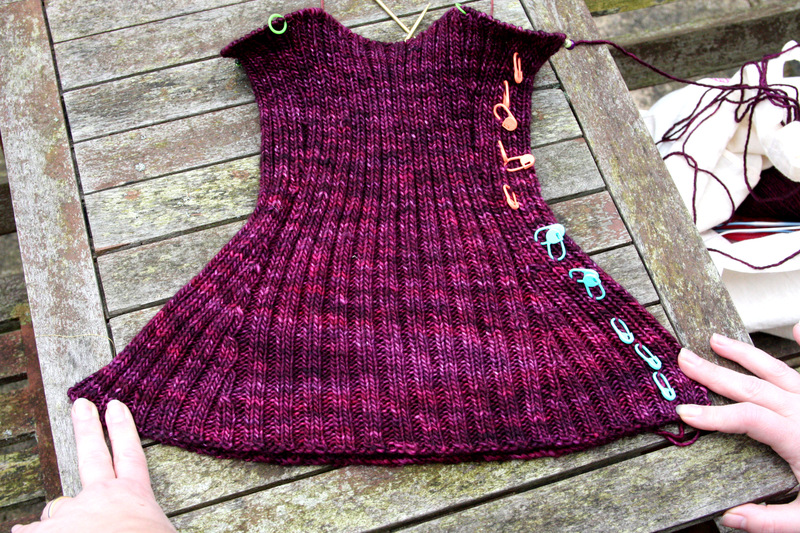 Plus, Emma wants it to definitely be an off-the-shoulder garment, so I will knit the yoke an inch shorter. I am a little nervous about reworking all of the math, and fitting it, without her here to try it on. It is easy to properly fit a garment when you have your model near to hand and can torture them by having them try it on every inch or so. In this case, I will have to rely on my judgement and my tape measure, and then ship it to her with fingers crossed. This entry was posted in Main and tagged Audrey, Audrey pullover, ease in ribbed garments, Kim Hargreaves, Knitting, Madelinetosh DK, negative ease, Rowan, Rowan sizing, Venetian Audrey by knitigatingcircumstances. Bookmark the permalink. I feel your pain, LOL! The hat I recently knit in Cocoon would have fit a 4L teapot had I not reduced the circumference by nearly 20 sts and gone down 2 needle sizes! (Who am I kidding? By the time I was done with the pattern, I’d completely re-written it!) Likewise, the patterns and schematics (if you’re lucky!) leave a lot to be desired. I don’t know why Rowan insists on doing this to us! Harumph! That said and done, Rowan is the crack-cocaine of the knitting world, in my opinion. My favorite FO ever is my Earth Stripe Wrap done in kid silk, worth every penny! I hope Emma had a nice vacation “back home”, and that she’s enjoying her studies at UBC and is adjusting to life in beautiful (wet! gray! humid!) Vancouver. It’s such a pretty city – I really enjoy it there. The MadTosh looks seriously beautiful, getting back to the post at hand! The Audrey is a great choice. Can’t wait to see the FO, and hope that it fits Emma to a T! Hi Ann, it seems I’m not the only one with this complaint against Rowan. But, like you, I love them nonetheless. I just looked up Madison – it is a pretty cool take on the cape – love the way the sleeves are incorporated. I still have the Earth Stripe Wrap on my radar. I need to follow your advice, however, and buy the Kidsilk before the colours are discontinued. I have got to the stage now where I just find a picture of a garment I like and I figure the rest for myself. It’s usually mistakes in the pattern or in Rowan’s case, they double how much yarn you need to buy and you have an entire jumper’s worth leftover! Once again, you’ve managed to find the ideal pattern to showcase the yarn and suit the wearer (Emma), which is a special skill in its own right. Can’t wait to see the updates as this sweater evolves. Already it’s clear this is going to be luscious.